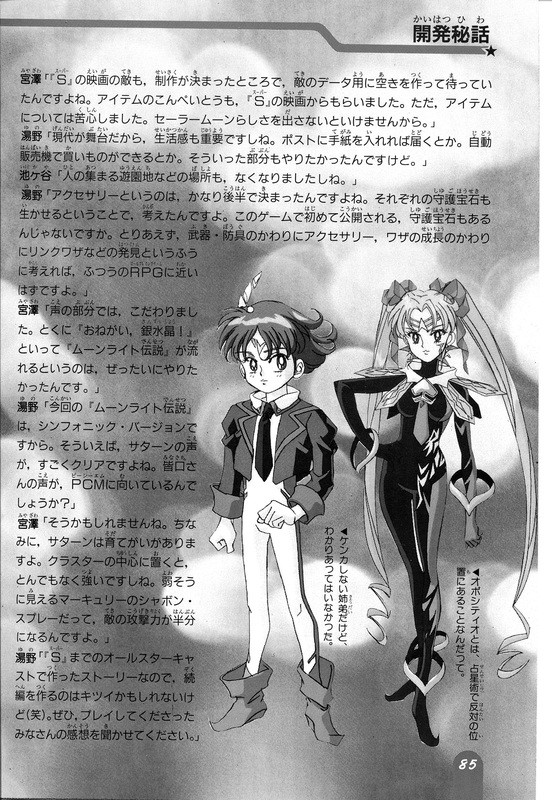 What Challenges Were Faced In Developing Sailor Moon: Another Story? 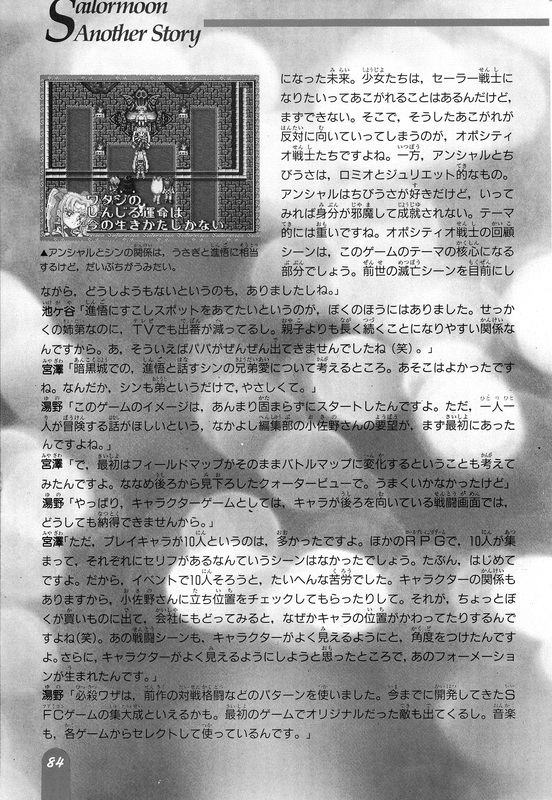 Released on September 22, 1995, – halfway through the anime’s SuperS season, despite being firmly entrenched in Sailor Moon S lore – Pretty Soldier Sailor Moon: Another Story was a groundbreaking RPG for its time. Not only was it an RPG built from the ground up for a young, female audience, but it also had a much larger cast of characters than most other games in the genre dared to at the time and even included audio from the actual voice talent. Today I’ll be translating an interview with members of the development staff so we can take a look at some of the challenges they faced in making the game. Let’s get going! Today we’ll talk with the game’s producer, director, and planner about some of the secrets behind this game’s long development. Yuno (Producer): The planning started two years ago, so it was probably pretty reckless to think about doing an original story about a manga with an unsure future. This led to a lot of trouble later. (laugh) Take Saturn, as an extreme example. We hadn’t seen the end of “S” yet when we were making the game. Miyazawa (Director): I was surprised to see that ChibiUsa became Super in the manga. We weren’t sure what to do. The return of Mugen Gakuen was itself a plan of sheer desperation. We developed the game with the plan that Mugen Gakuen would still be around. In order to have the story make sense, we added in some NPCs. If they weren’t there to explain, it’d be look pretty bad. The game may have been named “Another Story,” but that didn’t mean that we could just do whatever we wanted. Ikegaya (Planner): We had started development when Haruka and Michiru were still only silhouettes in the manga. We received some design documents from Ms. Takeuchi, but it’s hard to get a feel for their personality if you can’t see any movement. So we just had to make do. Yuno: Since the depictions of the Sailor Soldiers are pretty well set through the movies and otherwise, we decided to put emphasis on the personalities and depictions of the enemies. In the future, all of humanity is granted a long life, thanks to the Silver Crystal. All little girls want to be Sailor Soldiers, but that’s simply not possible. The Oppositio Soldiers are what comes out when that admiration is inverted. 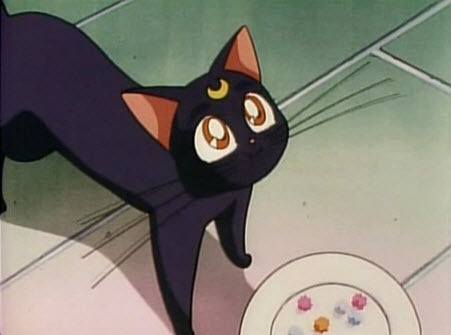 Read also: What Was Sailor Moon's Archery Attack? On the other end of the spectrum, you have ChibiUsa and Anshar, sort of a Romeo and Juliet. Anshar likes ChibiUsa, but his social status gets in the way and that love is not to be. The flashbacks from the Oppositio Soldiers is a core part of this game’s story. Like the scene where everything is destroyed in their past lives right before their eyes, and there’s nothing they can do. Miyazawa: That reminds me of the scene in the Dark Palace between Shingo and Sin, talking about love for one’s siblings. That was a great scene. She was nice to him, even if only for the fact that he’s also a younger brother. 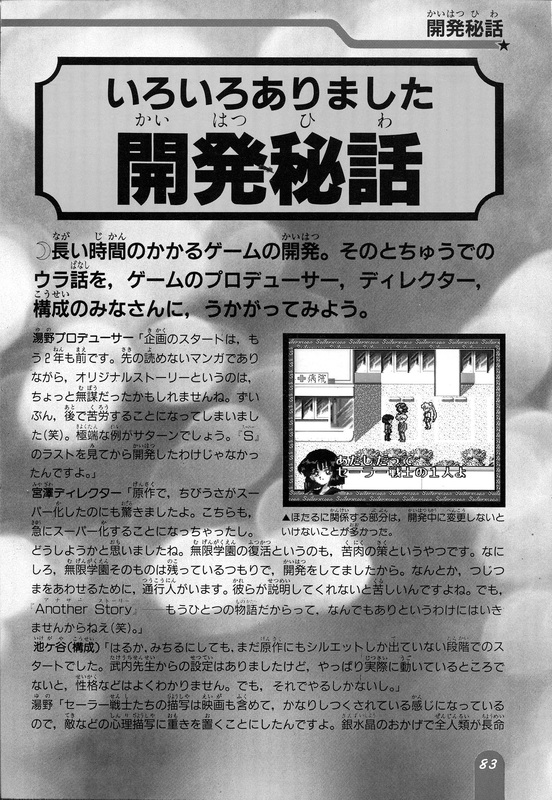 Yuno: We started work on this game before settling on a theme, but right off the bat, Osano from Nakayoshi’s editing group said that he wanted the story to have each of the characters off on their own adventure. Miyazawa: In the beginning, we thought about having battles take place directly on the field map, in a top-down, angled quarter view. Unfortunately, it didn’t work out. Yuno: Since this is a character-based game, it just wouldn’t work out to look at the characters’ backs on the battle screen. Miyazawa: But you know, we had ten playable characters. That’s a ton! Having ten characters come together in a scene and each talk, that’s simply not done in other RPGs. We may have been the first. It was a real challenge to get all ten into a scene. We also had to take the characters’ relationships into account too, so we had Osano check all their positions. One time I left to go buy something and when I got back to the office, all of the characters’s positions had changed. (laugh) We also added an angle to the battle screen so you could see the characters better. The formations were also born for the same reason – to make the characters easier to see. Yuno: We took the special attacks from our battle games and other previous titles. This is something of a compilation of the other Super Famicom games we’ve made so far, I guess. Some of the original enemies from our first game also make an appearance. The music is also selected from our previous titles. Miyazawa: Once the production of the Sailor Moon S movie was decided, we left some empty space in the enemy data for the enemies of the movie and waited. The kompeito2 is also borrowed from the movie. But we had a really hard time with the items, since they needed to feel like they were from Sailor Moon. Yuno: Since it’s set in modern times, it needed to feel like something from your day-to-day life. Like, letters are delivered if you put them in the mailbox, and you can buy things from vending machines. I wanted to do stuff like that. 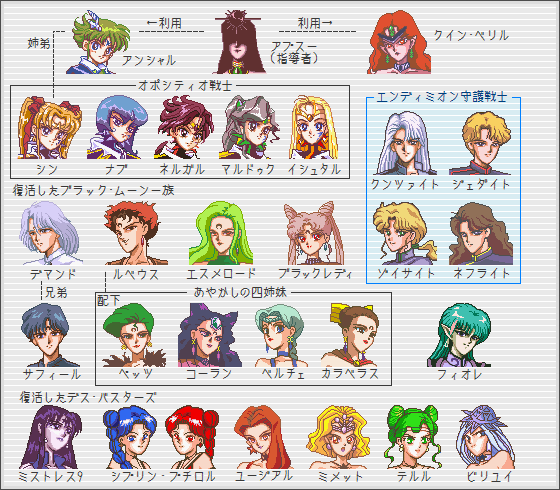 Read also: How Did the Concept of Codename: Sailor V Evolve Into Sailor Moon? Ikegaya: We also had to do away with some places like theme parks, where a bunch of people would come together. Yuno: We decided on accessories pretty late in development. I also thought up the idea of having them each make use of their guardian stones. The guardian stones appeared in this game, right? Having accessories in the place of weapons/armor and discovering link techniques in the place of leveling up your techniques makes it pretty similar to normal RPGs. Miyazawa: We were particular about the voices, specifically the line “I beg you, Silver Crystal!”. I really wanted to have Moonlight Destiny play. Yuno: This Moonlight Destiny is a symphonic version. Speaking of, Saturn’s voice was really clear. Ms. Minaguchi’s voice must be particularly well-suited for PCM, I guess? Miyazawa: That must be it. Speaking of which, it’s worth powering up Saturn. If you put her in the middle of the cluster formation, she becomes incredibly powerful. And though Mercury may look weak, her Shabon Spray will lower an enemy’s attack power by half. Yuno: This story is made up of an all-star cast from all the way through Sailor Moon S. I can only imagine a sequel would be really tough. (laugh) I hope to hear from all the players out there what they thought of the game. So there you have it, a few interesting behind-the-scenes stories about the development of the first – and only! – Sailor Moon RPG. Honestly, I’ve only played through the game once, and that was about 7 years ago. I’ve been meaning to play it again, and in Japanese this time, so having a chance to read through this has really piqued my interest. Have you had a chance to play it? What did you think of the mishmash between the anime and manga source materials? ← What Influence Did Rei’s Voice Actress Have on the Manga? Again, I’m grateful for these translations. Although it may look a bit crude, especially by today’s standards, I enjoyed Another Story’s overall plot and how it used the cast. It would have made the basis for a good mini arc or OVA. I liked how it mixed elements in from various sources, as well as callbacks to little details in previous arcs and characters. It makes for a richer universe. This (to my knowledge) is the only place where Michie Tomizawa got to say ‘Snake Fire’. 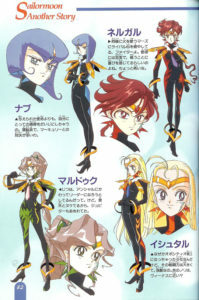 The Oppositio Senshi were an interesting idea, as a sort of Neziranger to the Inners. But I wish they could have been fleshed out a tiny bit more. Like Ali and Ann, they could use a future reappearance in the franchise. 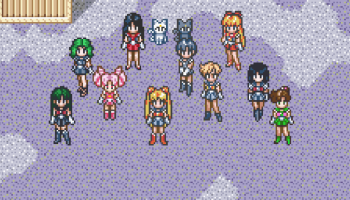 It’s a shame we have yet to see another RPG based Sailor Moon game. It lends itself to the format very well. 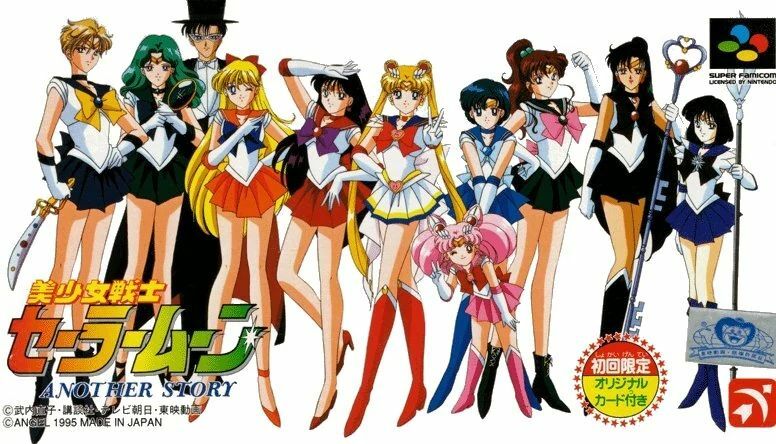 The Oppositio Senshi were one of those ideas that had a lot of potential, but they really needed to have a whole episode arc devoted to them. I really did like the concept of a team of evil Sailor Soldiers though. I think Sailor Stars really should have taken a page from this story, rather than going in the non-committal direction the anime and manga went. They were supposed to be Sailor Soldiers, right? But without any transformations or standardized attacks, they just felt like re-skinned villains from all the other seasons. But now I’m ranting about Stars. It was a really good game, though, and one I wish had seen a sequel. Unfortunately, it’s doubtful that the West will ever get an official release, but at least the game is available online in English! I agree that the whole concept of universal Senshi wasn’t really as well thought out and executed as it could of been. It would also have been nice to have seen some more male Guardians like Mamoru. Another thing that Naoko seemingly forgot. There is actually a fan-made sequel to Another Story lying around, though I haven’t played it myself. I’ve heard about the Another Story fan-made sequel and always thought about checking it out someday, but personally I have a really hard time getting too involved in fan-written stories. I know it can be nice to see how different people interpret the characters’ personalities, but at the end of the day, I keep thinking about how this is all a work created by a fan and I’m not actually “learning” anything new about a character. That said, many people have told me it’s a really good game! Never got past Mercury’s stage. Really annoying and long, and that was eight years ago. Can’t blame you. I think it took me a good three tries of starting and quitting before I finally made it through. The game had some serious balancing/difficulty spike issues. But the story is fun overall! I desisted when it first came out in Japanese when I got to Mercury’s boss stage. Then tried again, years later, when English was available and desisted again because the battle didn’t seem to end. Then tried once more, some more years later, using a walk-through explaining how accessories worked, and even though battles still took a long -boring- time, I finally made it all the way through the end. The story seems a bit crowded, rehashed and messy, but it is worth it because the original parts -the oppositio senshi- and the changes from the manga. I’m so happy this game was actually developed until the end. And this article is an awesome addition to it. Thanks again, Tuxedo Unmasked! The game has a low of flaws (too difficult, story moves too fast, etc.) and I also gave up 3-4 times before beating it. But In the end, I’m really happy they made it. I’m always really happy to see other interpretations of the Sailor Moon story! I hear that it’s pretty easy to find online, if one were so inclined. It’s a fun game, and fully translated into English! Boy am I glad to see Another Story covered! I love this game and its original story. I hope you get more fun facts about it in the pipeline. They did such daring stuff; exploring the Dark Kingdom’s geographical reach on Earth, history on the romances between the senshi and the four generals, plus giving Minako special stuff to do as team leader…. I could go on and on. Too bad it’s outside of canon; it would have been great if the comic and anime had built on it, in my humble opinion. I loved the story of the game, but I do kind of wish they toned it down a bit with adding in villains from every season. The Dark Kingdom fit in well since Mamoru was a central part of the story, but adding in the Black Moon and Death Busters seemed a bit excessive to me. That said, though, I really enjoyed the game! It’s too bad that it didn’t get a chance to have a more fleshed out story in comic or OVA form. I remember playing this as a kid and I barely knew what I was doing. I do not even remember if I completed the game. I actually like the mix of the different elements from both sources. I just remember I was so happy to play as Saturn, but was completely disappointed by her lack of attacks. I was happy to play as the other outer soldiers too, but same issue. I am disappointed they didn’t have the opposite soldiers for the outers though. This would have been a great storyline with a few tweaks for another season before sailor stars or something because supers was disappointing. If you ever have an opportunity to play it again, it’s a relatively fun (but simple) adventure in the Sailor Moon universe. The difficulty definitely could use some work, though, since it sky rockets a few times when you change characters, but otherwise I enjoyed the story for what it was. A nice, simple RPG that people who weren’t usually fans of the genre could still enjoy. I fondly remember playing and finishing this game more than a decade ago, when I was still new to the SNES. Maybe I was more imaginative as a kid, I was totally smitten with the romance between the Sailor Senshi and Shitennou. I enjoyed the battle system a lot, too. Back then I was a lot more tolerant of random battle encounters; nowadays I can’t stand being dragged into a battle every couple of steps. I’m pretty much on the same page here. The story is absolutely amazing and I love the dynamic things they did with the battle system, like the linked attacks and having all their powers linked to “crystals” that came back after every battle, so you didn’t need to hold back and just punch every enemy you came across. However, there were simply way too many encounters, and the game becomes a slog to get through. I first played the original Japanese version of this game using an emulator back in 2003. I read some sort of walkthrough guide in order to complete it. I didn’t speak Japanese at the time, but it was nonetheless so much fun. The amazing soundtrack and the beautiful graphics did it for me. Sailor Saturn’s Death Reborn Revolution looks amazing in this game! Some time later, I found out there was a fan-translated English version available online. I had such an amazing time trying to complete game once again. I fell in love with the new enemies. The game has really touching moments. I have completed it many times just because I really enjoy the plot. It possesses a lot of potential. 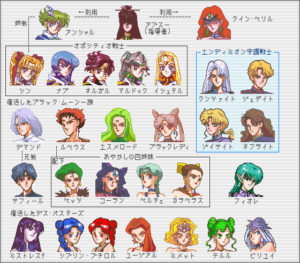 Something that struck my attention was the fact that the relationship between Sailor Uranus and Sailor Neptune seemed somewhat different in this game. Is it my imagination, or was it almost non-existent? Well, no wonder. After reading this interview, it totally makes sense now. Anyway, I started learning Japanese last year, and I thought it would be a great idea to buy the actual Japanese game cartridge. Now I’m finally playing this masterpiece once again the way it should be. Yes, it takes me quite some time to read and understand some of the dialogue, but it’s absolutely worth the challenge. I never get tired of it. I would love to do a Spanish translation of this game in the future. There are thousands and thousands of Sailor Moon fans out there that unfortunately aren’t able to enjoy this game due to language barriers. I’d really like to do something about it. Posted 2019-03-23 at 10:02 pm by A.J. 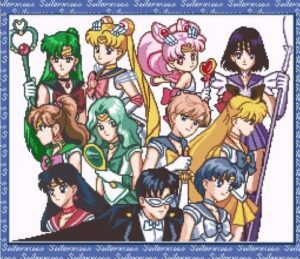 Did it bother anyone else that all the senshi attacks in this game were voiced except “Moon tiara action”? Like, she says something, sure, but it’s not that phrase. Also, I felt that the enemy sprites were too small on the screen; particularly the bosses. Great work, I don’t really know anything about the game, but this was a very enjoyable read. The depth of the translation projects still astound me. Quick note – I think there’s a typo at “he Shabon Spray”! Good catch! You’re correct — it should read “her Shabon Spray.” Fixed!